There is a time of the year, dependent upon the summer’s weather, when pears are plentiful on our two pear trees. Fat, ripe pears, too plentiful to be used all at once. The trends of Northwest weather are squirrelly enough that we are never sure when that might happen, but it always happens nonetheless, either early or late, to the extent that we are looking for ways to preserve the pears’ bounty. Here at Chez Bullhog, we’ve tried everything: pear chutney, pear butter, pear nectar, perry and just plain old pear preserved in syrup. But none of these have truly preserved the flavor of a late summer’s day the way that these scones have. Pear-filled scones, while so good fresh, also freeze well so that if you exclude the air and use a plastic bag, you’ll have the flavor of summer back in an instant on reheating. One caution, though: while using a cryovac system may make the pear a little more real, it may also crush the air out of your scones. On the other hand, you may want to throw caution to the wind. They work out pretty well regardless! Peel pears, score their faces and slice by ¼ inch layers to the core so that you have about 1½ cups of diced pear. Put the 2 T of water and the 3 T of sugar in a saucepan, heat over low heat and add pears. Simmer 5 minutes, until the pear is hot but not cooked. Set aside to cool. Preheat oven to 475 degrees. In a mixing bowl, stir together the flour, baking powder and salt. Cut in the softened butter until the clumps are smaller than a pea. Squeeze the mixture with your hands and break down with your fingers so that the butter is incorporated and flour mix is crumbly. Beat egg and yolk and reserve 2nd white for a glaze. Toss egg and then the milk into the flour mixture, working lightly with a fork. Add the 1/3 cup sugar and knead for 15 or 20 seconds in the bowl, just until the dough holds together. Grease a large cookie sheet with butter and set within reach. Divide the dough to make two equal amounts. Working on well-floured surface stretch dough out with your fingers to make two 7” x 10” rectangles. Take pear dice out of pan with a slotted spoon, squeezing slightly to remove excess juice, and spread it evenly onto one of the rectangles of dough. Carefully top with the second dough rectangle, aligning edges. 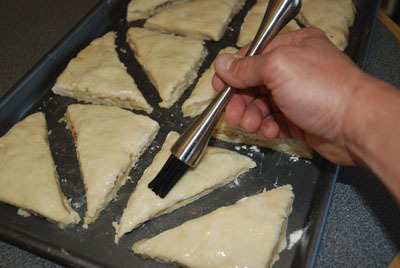 Using a floured knife or dough cutter, slice the rectangle into six squares, and then cut each square into two triangles, so that you have 12 triangular scones. Carefully move these onto the baking sheet. Whisk together the egg white and a little water, and brush scones twice with this to coat the surface well. Sprinkle evenly with Demerrara sugar. Bake at 475 degrees for 14 minutes. Remove to a rack to cool for several hours for true scone texture, covering with a clean cloth after the first hour. Even after all of the holiday goodies I’ve eaten this looks fantastic! Pears are so underused in baking and are so very good when cooked. Just beautiful! 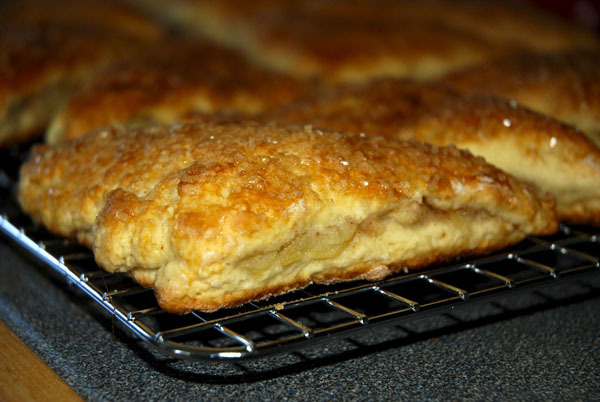 Thanks for the great pear scones recipe. These things are great!